China’s state council, (the equivalent of the UK’s cabinet), has announced a number of new initiatives and plans to tackle the country’s waste management and recycling issues. From an ambitious pilot scheme for urban development titled ‘cities without waste’ to banning foreign imports of waste for recycling, waste management and environmental issues are becoming more of a priority for this huge economy than it has been in the past. 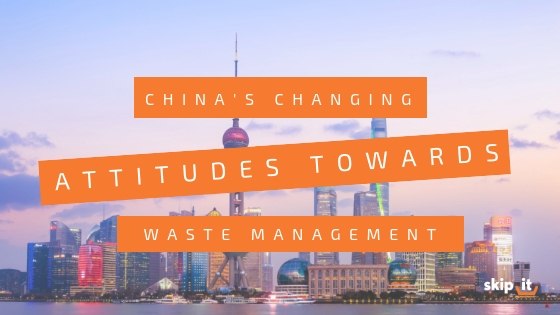 Read on to find out how China’s approach towards waste is rapidly changing. In a concerted effort to tackle the dependence upon landfill for waste management purposes and to reduce the negative impact that solid waste has on the natural environment, the Chinese council hopes to encourage more environmentally friendly development styles and lifestyles. This is in order to cut the amount of solid waste that’s produced at the source and transform it into resources. So far, there are ten cities across China that have been identified as having the suitable conditions in order to be selected in the new pilot programme entitled, ‘cities without waste’. The Chinese council also aims to have an integrated management and a technical system fully operational by 2020, in order to ensure more cities without waste are constructed. By 2020, the Chinese council also aim to have made substantial progress in terms of reducing the use of landfill waste in the selected pilot cities. It also called for Chinese citizens to adopt ‘green lifestyles’ in order to drastically reduce the amount of household waste produced by the country each year, in order to transform this waste into reusable resources. China has also recently announced a commitment to clamp down on illegal lead-acid battery recycling, which is typically sourced from old cars, in a bid to shut down the illegal recycling plants and factories that are responsible for polluting the environment. The country also aims to increase the collection rate of lead-acid batteries to 70 per cent by 2025. There has been an increase in the demand for lead-acid batteries for energy storage, cars and electric bicycles, which has increased the demand for recycling them once they’ve been used. However, Chinese policymakers will also need to ensure that the waste collection and transportation of these lead batteries is also regulated properly in order for them to be recycled legally. According to a 2017 industry estimate, China is responsible for 3.3 million tons of lead battery waste each year and currently, fewer than 30 per cent are recycled responsibly. The majority of these old lead batteries have been taken by informal and often illegal businesses with poor health, safety and environmental standards. It has been one year after China announced a ban on accepting foreign imports of waste material to be recycled responsibly. This came as a shock to the many countries that came to rely on China to recycle their waste, including the UK who sent plastics recycling to China. The UK was particularly worried about the ban, as a vast number of the county’s plastic recycling was sent abroad to China to be sorted and recycled. Part of the reason for this was because much of the UK’s household waste isn’t sorted by material type when it gets collected by local councils and taken to a recycling centre. Most countries who are seeking to buy waste prefer it to have already been sorted before they get their hands on it. Those countries like The Netherlands, who have a waste management system which includes the sorting of recyclable materials, haven’t been as badly affected by China’s ban compared to countries like the UK. In response to last year’s ban from China, some Chinese recyclers decided to move their business operations overseas to take advantage of cheap plastic in their new locations, before re-exporting it back to China as recycled pellets. From the UK’s perspective, other countries have agreed to accept the country’s waste including Malaysia, Poland and Turkey. However, some environmentalist campaigners have reported that several illegal waste dumps have started to spring up across Malaysia, polluting the environment due to the sheer amount of plastic waste that is being accepted. At Skip It, any waste that we collect from you through all of our services, right the way through from Household Clearance and Skip Hire to Roll-On-Roll-Off will be correctly sorted before we take it to a recycling centre. We collect both household and commercial waste, from shops and offices to large construction sites – there’s nothing we can’t handle! Contact our friendly team today to find out how we can help you recycle your household and business waste. How Do I Dispose of My Old Christmas Tree?